Pineapple Raisin Sauce for Ham, Recipe rewind because some things are too good to miss! Recipe rewind, because in the beginning there is a blogger who has no readers. She still posts great food in hopes that the readers will come..........you can also view it here in the archives, Friday December 3, 2010. It is funny how you will remember, a food memory, from many years gone by. 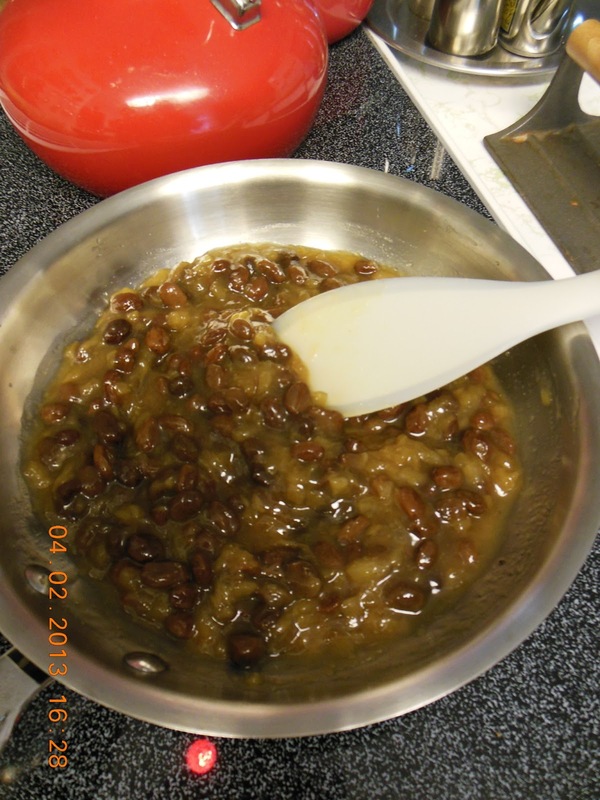 In thinking to myself how I might “market” the December 2010 Culinary Smackdown, without pestering every blogger I know into smithereens, I remembered a sauce my Mom use to make to serve with ham, because it had raisins. I also remember that most of it would be eaten at dinnertime, and only a spoonful was leftover. I usually ate that last little bit, so I could wash the dish. Turkey was for Thanksgiving, always. I remember having turkey at Christmas, but I believe that only happened a couple times. Once we had goose, stuffed with apples, prunes and onion quarters. Usually though roast beef was Christmas dinner, roast beef and Yorkshire pudding. As much as I love Thanksgiving, two holiday turkey dinners in a row is too much turkey. I have been making a roast beef dinner for years now, and this year we will be having beef and ham. Ham because my new employer generously gives a turkey at Thanksgiving and a ham at Christmas. And we all know, ham needs Pineapple Raisin Sauce! When I first started worrying that no one would submit an entry for the Smackdown, I remembered that pineapple raisin sauce. I remembered it because of the raisins, not because I can also be an excessive worrier! Like many of the foods cooked and served, Mom did not use a recipe for the sauce. I remember the sauce so vividly; I think I can recreate it in my own kitchen. I know it started with a can of crushed pineapple, including the juice. Then a big handful of raisins, some brown sugar, a bit of cider vinegar. Combine the cornstarch and water, stirring until smooth. Pour into the simmering fruit in a thin stream, stirring continuously. Cook, until mixture is thickened and transparent. Serve with ham. such memories, this sounds lovely, I like your signs as well.Have a great weekend! I love the when in doubt add wine sign! And the raisin sauce does sound delicious. Hope that your Sunday is wonderful!